The 20th Special Forces Group (Airborne) or 20th SFG(A) is one of two Army National Guard groups for the United States Army Special Forces. 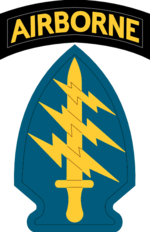 It is headquartered in Birmingham, Alabama (and is thus part of the Alabama Army National Guard) and as part of the United States Southern Command has an area of responsibility covering 32 countries, including Latin America south of Mexico, the Caribbean, the Gulf of Mexico, and the southwestern Atlantic Ocean. The area is shared with the Eglin Air Force Base-based 7th Special Forces Group, which is the active Regular Army Special Forces group responsible for the same region. The 20th Special Forces Group has battalions from Alabama (1st Battalion), Mississippi (2nd Battalion), and Florida (3rd Battalion), with detachments in Draper, Utah; Roanoke Rapids, North Carolina; New Milford, Pennsylvania; Camp Atterbury Indiana; Glen Arm, Maryland and Chicopee, Massachusetts. There is also a military intelligence company located in Louisville, Kentucky. Following the start of the Global War on Terror the 20th has been actively deployed to Iraq, Afghanistan and other places around the world. Wikimedia Commons has media related to 20th Special Forces Group.